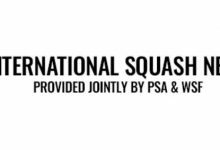 South Africa and Germany reclaimed their status as world top eight nations after storming through the last 16 round of the WSF Men’s World Team Squash Championship in France. 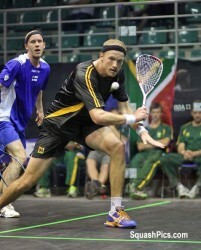 Seventh seeds South Africa, who finished in an all-time low 13th position in the previous championship in 2011, despatched Finland, the ninth seeds and one-time bronze medallists, 2/0. Stephen Coppinger, the Cape Town-based 28-year-old who boasts a career-high world No16 ranking, beat seasoned Olli Tuominen, a veteran of eight world championship campaigns, 11-5, 11-7, 11-9 before third string Clinton Leeuw defeated Matias Tuomi 11-4, 15-13, 11-9. “It means so much for us to get into the top eight,” said South Africa coach Richard Castle. “It’s really difficult when you’re out of the main group and just fighting for those lower play-off places. “But we had to beat those Finnish guys – they don’t just give you the games. South Africa will now face former champions England for a place in the last four. 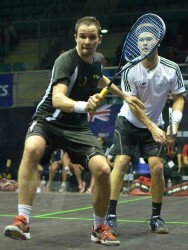 The second seeds, led by world No3 James Willstrop, knocked out British rivals Scotland 3/0. 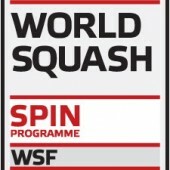 Buoyed by local support in the 2011 event in Paderborn, Germany emphatically exceeded their 16th seeding by finishing in ninth place – then moved up to eighth when a top six nation was disqualified. 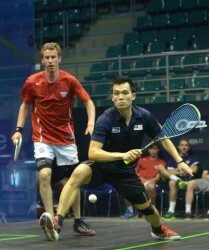 Two years on, the focussed sixth seeds today defeated New Zealand 2/1. 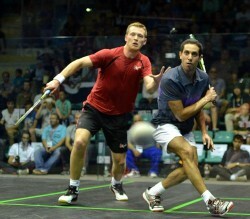 World No12 Simon Rosner led the assault, beating Campbell Grayson 13-11, 2-0 (ret.) 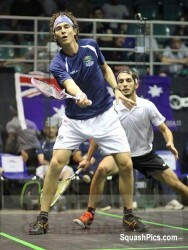 – and team-mate Jens Schoor clinched victory by outplaying 23-year-old Kiwi Evan Williams 11-5, 11-5, 11-5. 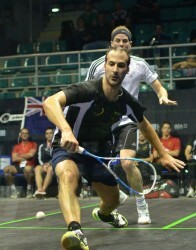 New Zealand gained some consolation when Martin Knight beat Raphael Kandrain the best-of-three dead rubber. 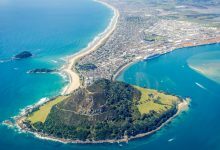 New Zealand played the tie in uncharacteristic white kit, forced to forgo the traditional ‘All Black’ Kiwi attire in favour of the higher-seeded Germans – who also play in black! “It’s unbelievable,” said German manager Oliver Pettke of his team’s success. “I cannot find words to express my feelings. 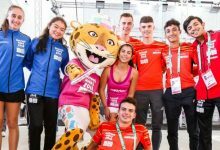 “Last year we finished in ninth position, but were later raised to eighth when one team was disqualified – but this time we have reached the quarter-finals by right. It was very impressive for me to see the team get to the quarters like this – I am really happy. 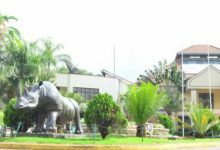 In fact, I think it is one of the best results we have ever had. “Having the last championship in Paderborn was very special for us – none of us will ever forget it – but now we have to just focus on our playing. Their opponents will indeed be fourth seeds Australia, 3/0 victors over Pakistan. 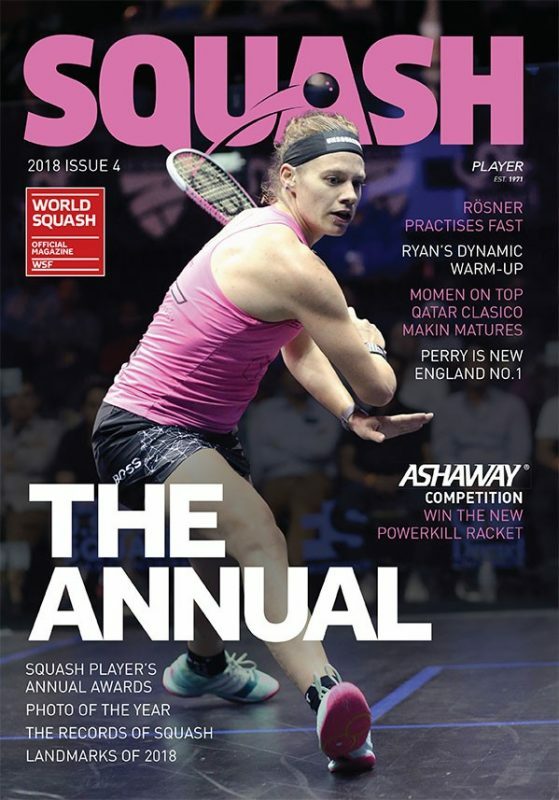 It was the most glamorous tie of the day – between the two greatest world team championship nations of all, who hold 14 titles between them and have contested three finals. 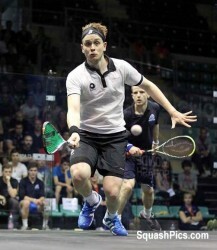 Cameron Pilley led the way in an hour-long tussle, beating the Pakistani number one Nasir Iqbal 11-5, 11-3, 5-11, 11-6.Ryan Cuskelly put matters beyond Pakistan’s reach by crushing left-hander Farhan Mehboob 11-9, 11-3, 11-6, beforeDavid Palmer added another significant victory to his post-retirement tally when he overcame Farhan Zaman 11-9, 11-7. “We have a lot of respect for Pakistan and there is a lot of history between our two countries,” said Australian coachRodney Eyles. “But when it comes down to it we’re just here to win the tournament and today’s win takes us nearer that goal. “But we had to be very alert for Pakistan today,” added the former world No2. 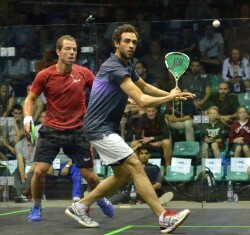 “Ryan played a hell of game – the lad he played is very skilful, but he neutralised him well. 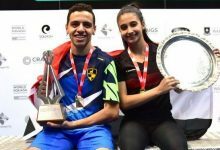 Favourites Egypt, bidding to become the first nation since 1987 to win the title three times in a row, eased to a 2/0 win over 15th seeds Canada. 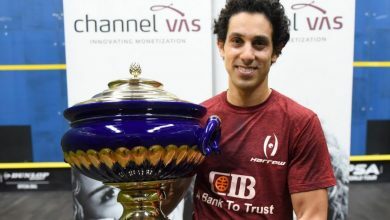 Ramy Ashour, the world No1 undefeated on the PSA World Tour for 41 matches over more than a year, beat Dane Sharp 11-6, 11-9, 11-8 before Tarek Momen sealed victory with an 11-6, 11-8, 11-8 defeat of David Letourneau. 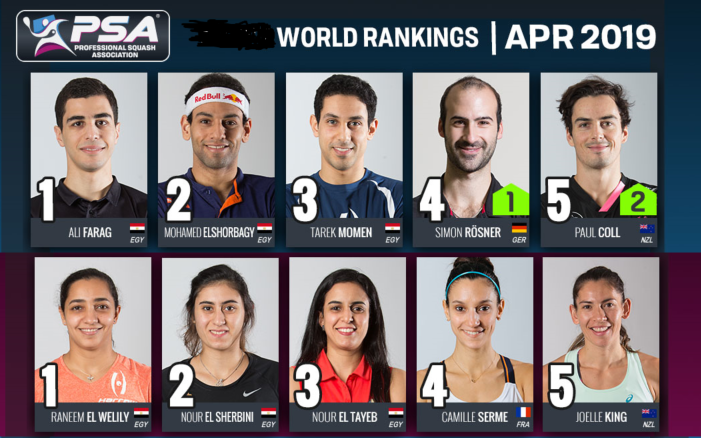 Egyptian coach Mohamed Medhat Morsi said later: “All these wins are important to us – even when the challenges are not high – because it gives us confidence. 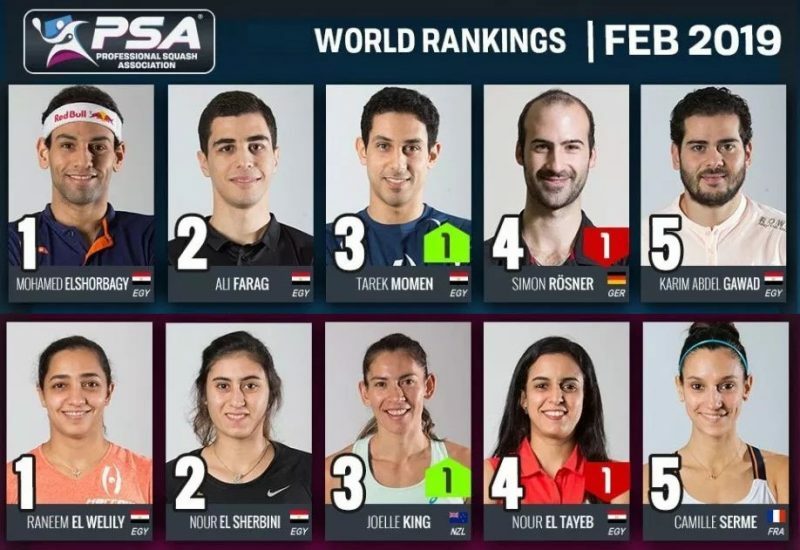 Egypt will take on India, the No8 seeds. “The boys are ready for the battle,” continued world No38 Morsi. “We have tough opponents in the next round. 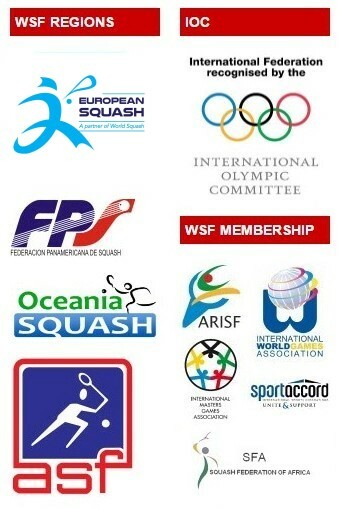 India are one of the countries coming up in squash. India beat Asian rivals Hong Kong 2/1. 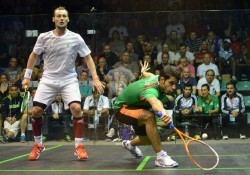 “We were very confident going into this match,” said Indian national coach Cyrus Poncha. “Being our Asian counterparts, we know their standards well. Malaysia will provide further Asian interest in the quarter-finals after beating USA 2/0. 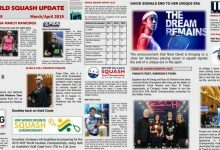 Ong Beng Hee, the 33-year-old Malaysian number one celebrating his tenth successive appearance in the championships, put his team ahead with a 7-11, 11-5, 11-4, 11-8 defeat of US champion Christopher Gordon. 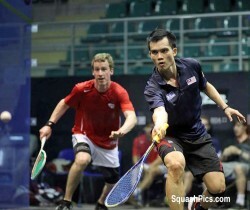 Muhd Asyraf Azan was too strong for US debutant Dylan Murray in the following match, but had to fight back from a game down to overcome the 18-year-old from New York 8-11, 12-10, 11-2, 11-8. On playing his 10th successive worlds, Beng Hee added: “It’s a little bit depressing truthfully as people keep mentioning it! It gets harder all the time, especially with all these young players coming through! “But the more I play in this event, the more special it becomes – and I am very proud to still be able to play number one for my country. “If my body holds out, I hope to continue playing for some time – and especially in next year’s Commonwealth Games and Asian Games, both of which are very important for Malaysia. The day’s play finished with a packed and partisan crowd cheering hosts France through to a 3/0 win over Mexico, the 13th seeds. 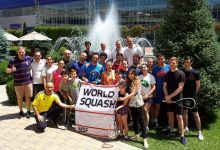 It took just ten minutes to open up the lead when Mexican number one Arturo Salazar was forced to concede the match after just one game to national hero Gregory Gaultier, the world number two from Aix-en-Provence, due to illness. 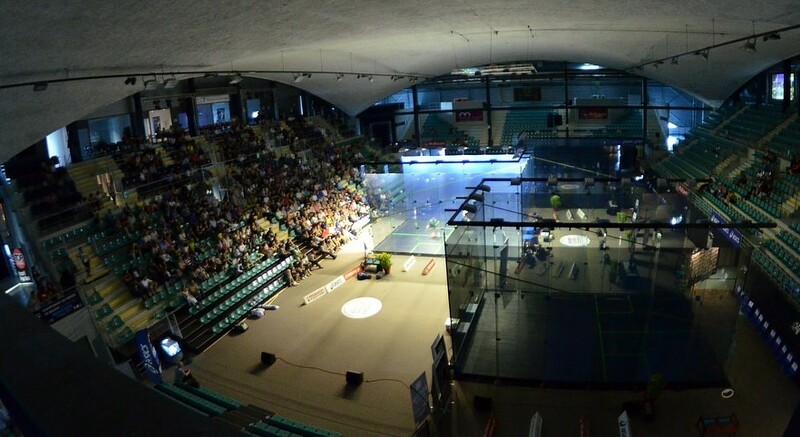 Third string Gregoire Marche sealed France’s win with an 11-3, 11-3, 11-5 victory over Eric Galvez – and, in the best-of-three dead rubber, the crowd were treated to another home win as Mathieu Castagnet beat Arturo’s twin brother Cesar Salazar 11-8, 11-6. Brian O’Brion bt Hartaj Bains 11-7 ret.